Dear Virtual Boys & Girls! I feel very excited to post the first VUE-MASTER reel today: the VUE-MASTER Demo Reel! 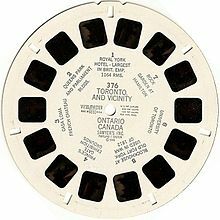 Some of you surly remember the VIEW-MASTER, or even Tru-Vue. Both stereo image viewers were successors to the classic stereoscopes of the 19th century, which let you experience stereo image pairs in real 3D. VUE-MASTER turns your VIRTUAL BOY into a stereo image viewer! Just like the classic stereo reels, the VUE-MASTER Demo Reel features 7 stereo image pairs: 3d photos as well as renderings I made. Many thanks to Hedgetrimmer, who provided his VB stand & controller 3d models! But VUE-MASTER is even more: it's an easy-to-use template for VBDE, that also enables non-developers to convert their own graphics to VB-ROMs – just by following an easy step-by-step guide! I feel that there's much more creative potential in this community and that there are many people like me, who don't have any programming skills, but would like to work and experiment with VB graphics. And I hope that this tool may release some of this creative potential. So let's REELease the river and flood our beloved 3d machine with thousands of beautiful, interesting or ugly pictures! I know you know that, but others may not know it. The two technologies together would allow you to make any 3d graphic not just be limited to 3d models. This is the coolest friggin thing! This takes me back to my childhood when I'd spend way more hours than I care to admit, playing with a View Master. Maybe a special area of the website or a pinned forum topic should be created for posting reels so everything is in one place and not scattered around various topics. There's also an updated version of the Demo Reel ROM (v1.1) attached to this post (with changes to the main menu mostly).